Have you ever come up against the same problem? Like the scenarios mentioned above, how to turn new DVD releases ISO image into AVI format is a frequently asked question that has long baffled many people. The rejoiced thing is that nowadays many DVD ripper software emerges to help us rip ISO to AVI easily, for example, Handbrake rip DVD. But problems seem to be unsettled endlessly. It doesn't look like each DVD ripper for Mac program gets along well with the newest macOS Mojave 10.14. So if you've upgraded to the macOS 10.14 and want to convert ISO to AVI on Mac, a program compatible with macOS Mojave is deemed as indispensible to settle the issue. 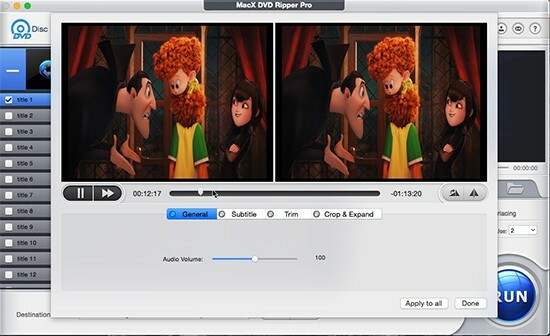 As a matter of fact, MacX DVD Ripper Pro happens to be upgraded to support the latest macOS Mojave 10.14, which helps you easily convert ISO image to AVI on Mac without encountering any problem. It is excellent for you to deal with other video format conversion, like ISO image to MP4, MKV, MOV, WMV, etc at fast speed and high quality. Below is the step by step guide of converting from DVD ISO image to AVI format on macOS. Free download this DVD video converter for Mac and kick off it, click "DVD ISO" to import it on your Mac computer. Select AVI as the output format. Simply go "PC General Video" from the drop-down box, choose "AVI Video" as output format and hit the "Done" button for ISO to AVI conversion on your Mac. 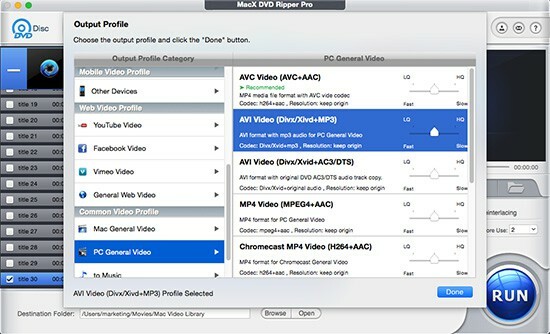 In addition to convert DVD to MP4, MOV, AVI, FLV, WMV, etc, MacX DVD Ripper Pro also supports converting ISO to iPhone, iPad, Samsung, HTC as you like. Tips: before you convert ISO to AVI on Mac Yosemite/El Capitan/macOS Sierra, you are also allowed to edit the file to make it personalized, e.g. you can trim video segments you like or get rid of unwanted parts, crop video play region to suit your players in appropriate resolution, etc, and even choose the inner subtitle you prefer or add downloaded subtitle to your file. Hit the "RUN" button to start ripping DVD ISO to AVI on Mac. After you get the ISO image converted to AVI format, you can play it on PSP, Android or upload to Youtube, Metacafe, etc. Please note that besides ripping ISO images easily, this ISO to AVI converter for Mac also helps to backup and rip the latest copy-protected DVD to AVI, MP4, FLV, formats of iPhone Xs/X/8/7/Plus, iPad Mini 4/Pro, Galaxy S9, HTC 10, etc. in a few clicks. After all conversions done, you can take advantage of MacX MediaTrans, an excellent Mac to iPhone video transfer, which enables you to move all your converted videos, like AVI, ISO, MP4, FLV etc. from Mac computer to iPhone iPad without any bothering of formats incompatibile issue. Still looking for ISO converter to convert ISO to MP4/AVI/MOV/MKV? This guide shows you the best ISO file converter to convert and compress ISO image, as well as work as an ISO creator to create ISO image.